Our open cockpit 1930’s WWII vintage biplane has been designed specifically to cope with our adrenalin pumping aerobatic flights. Nothing compares with the exhilaration of hanging by your straps upside down in Tiger Moth World’s open cockpit biplanes. 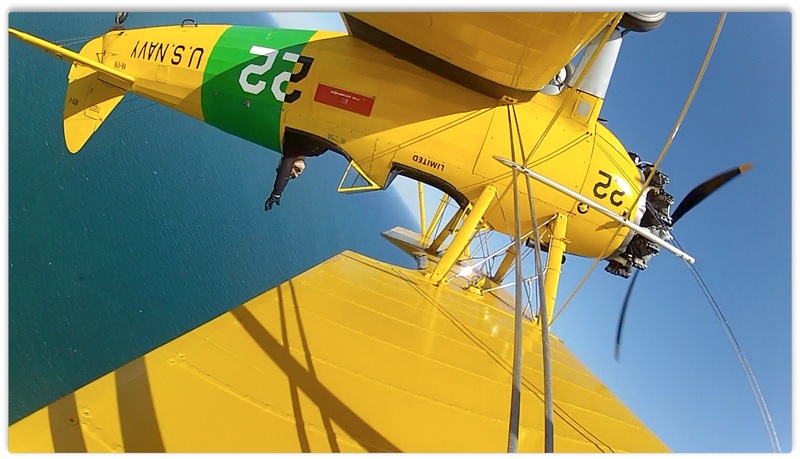 Tighten your straps and enjoy the ride – choose from mild or wild or EXTREME aerobatic flights. So, if you think you or your friend have “been there and done that” – think again! 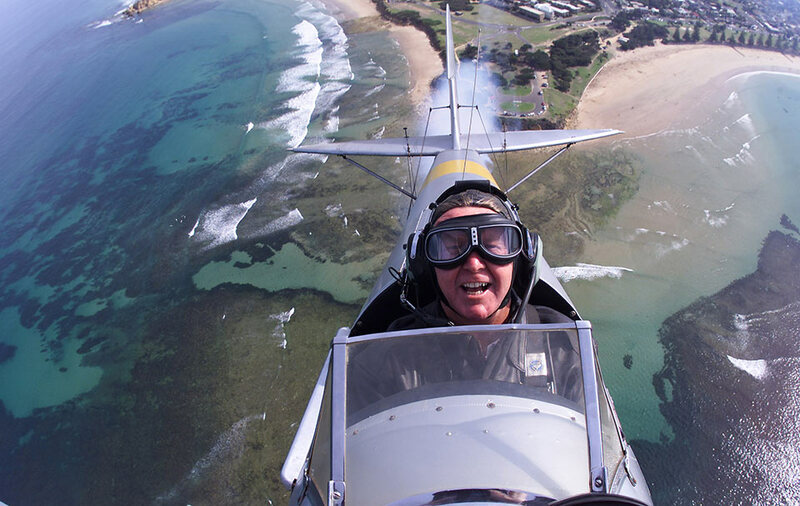 You haven’t experienced the ultimate adrenalin rush of Extreme Aerobatics in our WWII biplane. Put it on your bucket list! 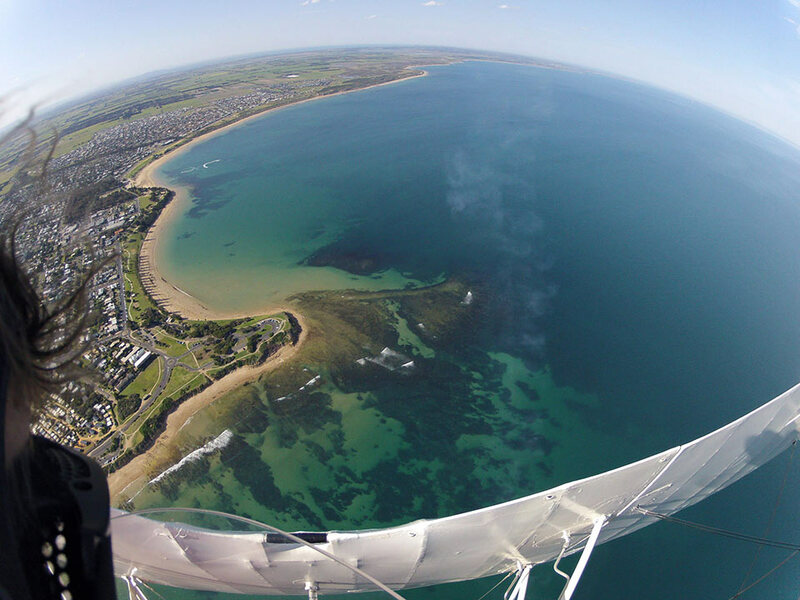 What to expect on your Aerobatic Flight? 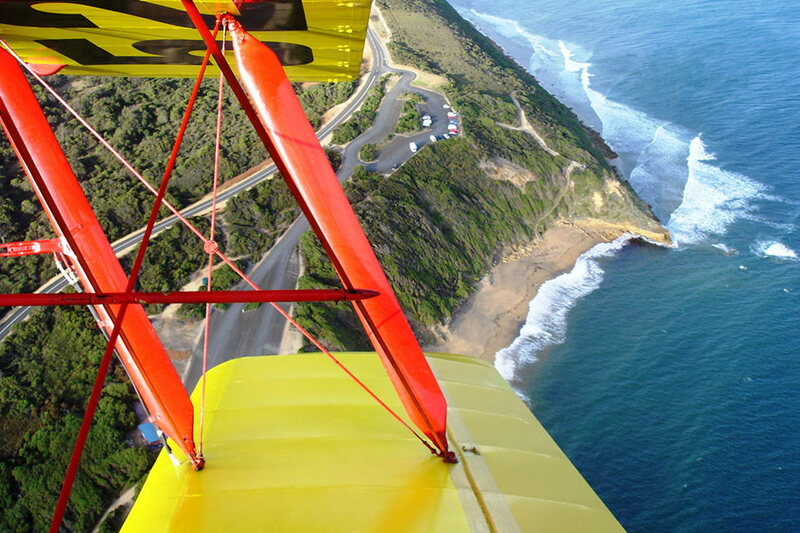 On take-off you are already low level, winging your way along the spectacular coast of the Great Ocean Road. 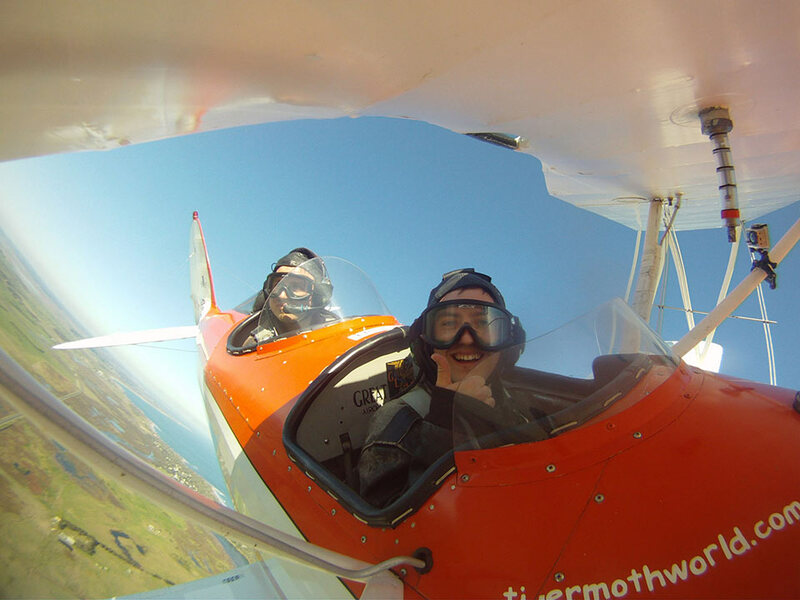 It’s exhilarating – the wind in your face it’s fantastic and not so scary… the pilot will advise you when he’s about to start the aerobatics. 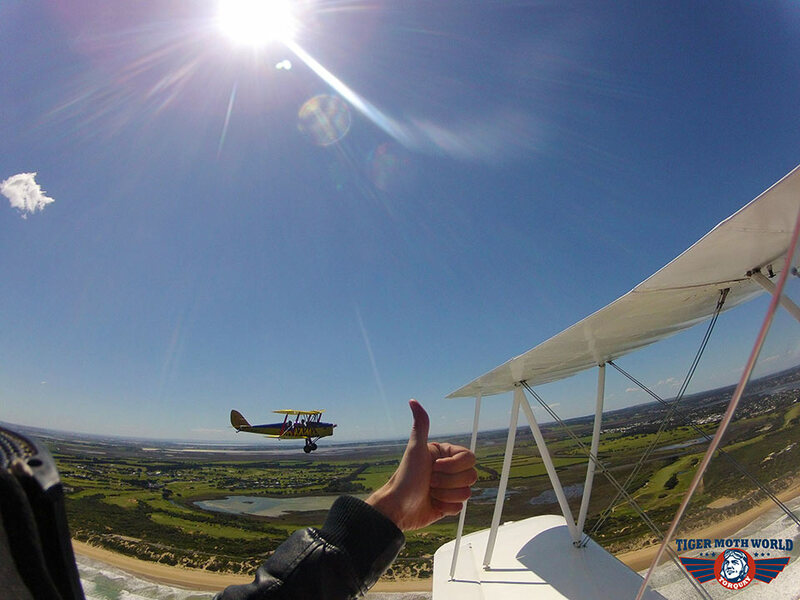 That’s when this spectacular adventure flight turns into an adrenalin junkie’s heaven. Your Super Tiger soars into a series of loops, rolls and stall turns … You’re not sure whether you’re still upside down or not. Or, which manoeuvre was the spin and which was the roll? You’re glad they checked that seat belt. That’s the only thing holding you in – plus some “G” forces. You yell and scream for more … (or perhaps not). The pilot is happy to oblige – he’s having as much fun as you are. And, just to make sure you’re still awake, he throws the Tiger into a spin and you spiral dive out of the sky. You are guaranteed to have the biggest smile on your face when you land and memories of an absolutely awesome aerobatic adventure flight. Don’t want to commit all that excitement just to your memory? Then get it all on “Tiger Cam” – that’s right, you and your Tiger are the stars of the show. 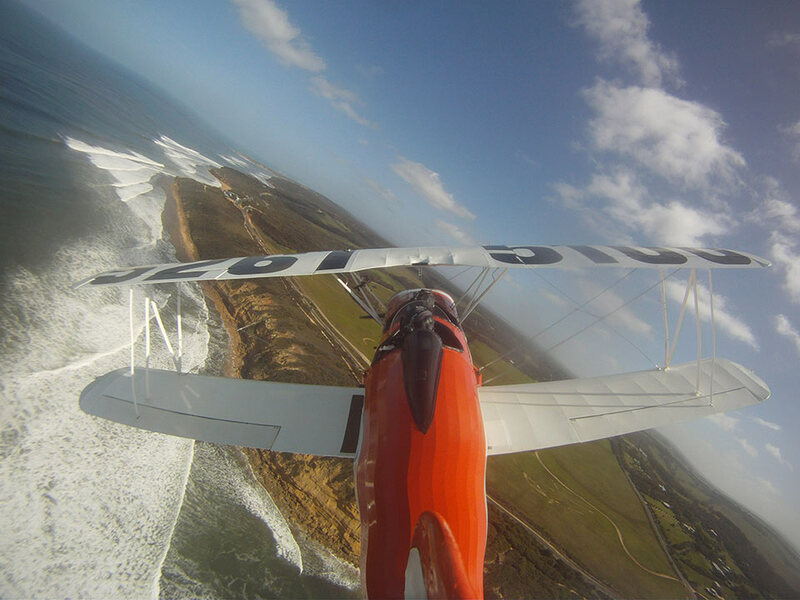 Choose from our aerobatic options…. The ultimate low level roller coaster in the sky! Steep wing-overs and turns as you cruise down the Great Ocean Road cliff line. 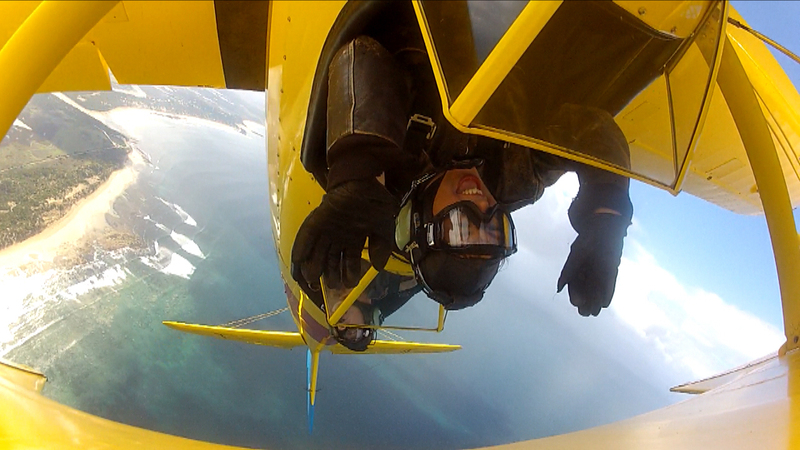 Dip your toes with our first aerobatic experience. Includes the Barnstormer plus loops and barrel rolls – now you’re inverted up to 2.5G forces. Our second level of aerobatics includes the Barnstormer plus loops, barrel rolls, stall turns & more – now you’re inverted up to 4G forces. Not for the faint-hearted. This full aerobatic sequence includes more loops, rolls and stall turns as well as death defying spins. For the thrill seekers.